Sampdoria, despite significantly bavleny composition in the new year, still fighting for a place in the Europa League. At the moment the team by Mikhailovich behind 3 points from reaching the fifth Fiorentina. Cagliari hopelessly stuck in his own unfulfilled moments. Zola does not preach total games in the attack, as the previous coach Zeman, but when conceding first, it is necessary to win. In the last round Cagliari played a typical game, passing first from Verona, they have long been besieged by the gate, but ultimately failed to convert a mountain surest moments and lost 1-2. Sampdoria won the last round with great difficulty at Atalanta, and this is another alarm bell. How much should sound the bell to Mikhailovich realized that attacking game model is not suitable to his team? In this match we again expect goals. 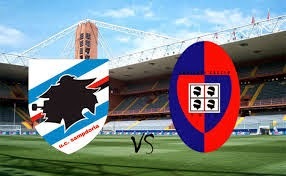 From both sides - Sampdoria has top players, and Cagliari should finally take our chances in attack.